Use instead of your coffee and drinks. Drink any of our natural teas for health and healing. Drink "straight" with only hot water or drink chilled. Add a nut-milk, honey and cinnamon to make a "Latte." Chill with honey to drink as "Ice Tea." Prepare hot with "lemon & honey." Or use between treatments of your bottled Chanca Piedra. 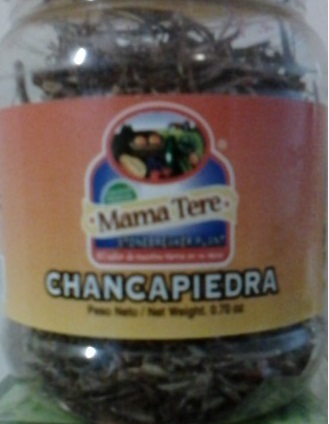 All forms of our Chanca Piedra are potent. Taking them together makes a powerful treatment. Keep tea in the home or travel. Let the kids and grandparents drink and enjoy it. Feel results from pain quickly. Also, great for Uterine Fibroids relief. Chanca Piedra, means "stone shatter," "crusher" or "stone breaker." It breaks calculi stone; traditionally used to support proper liver, kidney, and gallbladder function as well as to break and flush out kidney stones. Good for urinary tract. It is used as therapeutic herb for liver, kidney, and gallbladder health. Hence, it is effective in conditions including colic, diabetes, malaria, dysentery, fever, flu, tumors, jaundice, vaginitis, gonorrhea, and dyspepsia. It kills pain, expel intestinal gas, to stimulate and promote digestion, to expel worms, and as a mild laxative. Almost unknown by Western culture, it has a long history in herbal medicine in every country where it grows.. It is indigenous for the Amazon Rainforest and incredibly this weed-like plant has unbelievable wellness benefits.